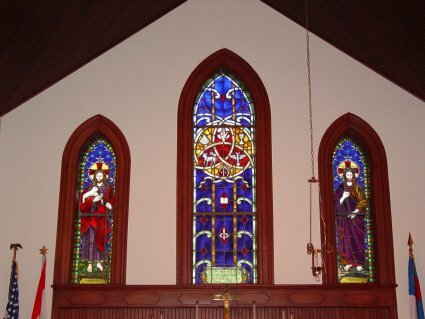 THE GOOD SHEPHERD Window: (left) the Rev. A. B. Flower, who came to Lexington as a missionary in 1869, named The Church of the Good Shepherd. The mission he established was the first Episcopal Church In the thumb of Michigan. The Good Shepherd is one of the oldest references Christ made to his mission. He called himself the Good Shepherd. In the beautiful Gospel for the Second Sunday after Easter (1928 Prayer Book), when he said: "I am the good shepherd: the good shepherd gives his life for the sheep. But he that is a hireling, and not the shepherd, whose own the sheep are not, see the wolf coming, and leaves the sheep, and flees: and the wolf catches them, and scatters the sheep... am the good shepherd; and know my sheep and am known of mine,... and I lay down my life for the sheep." (St. John X. il. The design for this window is traditional. THE TRINITY Window: (center) The concept of the Holy Trinity was not espoused as such during Christ's ministry on earth, probably because there seemed to be no need for it. Later on, however, it appeared that the various manifestations of God should be put into concrete form. Thus the doctrine of the Trinity evolved. Indeed, one of the greatest controversies of the early church centered about this doctrine. The fact that God came to earth in the physical form of Christ has boggled minds for centuries. Yet, the very fact that a spirit was able to accomplish things a mere mortal cannot seems to be lost as we ponder Christ's birth. The manifestations of God appear to different people and at different times in various ways. The original appearance of the Holy Spirit was at Pentecost. He came down in tongues of fire and then as a dove - the eternal symbol of peace. In the Trinity window, we see various symbols of both the Trinity and of the Episcopal Church. In the upper middle part, in red, we see the symbols of the Trinity, the hand raised in blessing symbolizing the Father; the Lamb, the sacrificial victim in the ancient Jewish religion (and let us not forget that Christ was a Jew) is the Son; and the dove is the Holy Spirit. The dove in our window is not artistically traditional. Most doves in works of art depleting the Holy Spirit are pointed downward. This dove has his head high but is looking downward, about to alight. In the white areas of the circle where the Trinity symbols appear, we have symbols of some of the important doctrines of the Episcopal Church: The shell, represents baptism (a shell is traditionally used to pour water on the head of the person being baptized); the chalice, represents the Lord's Supper; the Bishop's Mitre, or hat, represents our government by Bishops, as our name implies. In the first red diamond below the circle, we see the open bible, which is the foundation of our faith. In the second red diamond, we see the fleur de lis, which is a symbol of the Blessed Virgin Mary, the mother of Our Lord. As Episcopalians, we believe In the Virgin Birth. Christ Church Window: (right) The third window is "CHRIST THE KING IN THE COURTYARD OF PONTIUS PILATE". 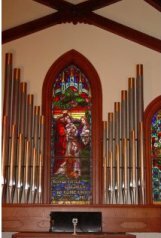 It honors the former Christ Church, Croswell, which was also founded by the Rev. A. B. Flower. This is not a traditional concept of Christ the King. Traditionally, in works of art, Christ the King appears to be a very regal figure with a crown on his head, clothed in gorgeous robes and with the orb and scepter in his hands. Christ never represented himself as this kind of king. The mortal Christ was never more kingly than when he stood in Pilate's courtyard. All four gospels bear the account of the trial. 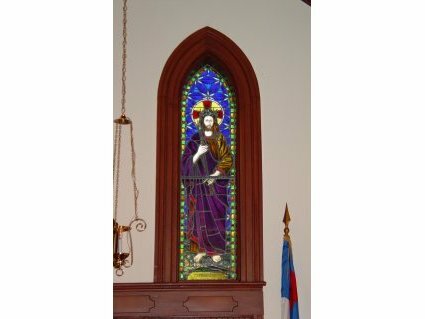 Some of the details vary, but where there are differences, the word of the majority of the evangelists has been incorporated in this window. Here we see Christ wearing a crown of thorns, clad in a purple robe and holding a reed. All of the accoutrements of kingship are here, but the intention then was to mock Christ. When Pilate asked him if he were a king, Christ replied, "Thou sayest it." The good Shephers window was given by Mary B. Richards in loving memory of George (Ned) and Margaret (Peg) Henry. Miss Richards, a member of the parish since 1966, is a native of Pittsburgh. She was a sincere and devoted friend of the Henrys. Ned Henry was a Lexington native, but he spent most of his life in Detroit. He and his wife, Peg, were active In St. Columbia parish, Detroit, until they returned here in 1966 to live. Peg was active in the Girls' Friendly and was Secretary to Bishop Crowley, former Suffragan Bishop of Michigan. Ned served as vestryman in the former Good Shepherd parish, and Peg was an Altar Guild member and was once Sunday school Superintendent. The seven branch candelabra on our altar here at Trinity, and also on the altar at St. Columba, were given by the Henrys in memory of their daughter, Nancy Jean. The Trinity Window was given by Norman L. and Marion Parker in thanksgiving for those who have served their country. 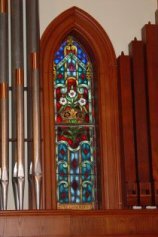 The Parkers were formerly members of Christ Church, Grosse Pointe and have been members of this church since 1971. The dedication of a window as an expression of thanksgiving is not new, but one doesn't hear of it too often. This window is not a memorial as such, for it honors those who are still living as well as those who have entered into eternal life. 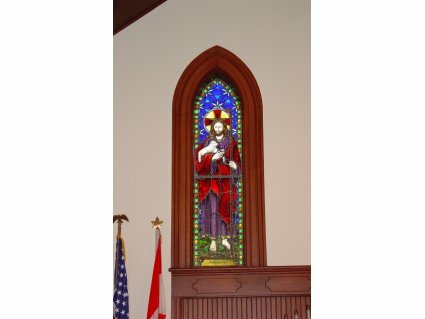 The Christ the King window was given by a group of sixteen people who calls itself "The Dizzy Dozen". This group, not all of whom are Episcopalians, met weekly (usually on Friday nights) for dinner and fellowship. The Latin Inscription on the Christ the King window translates as "To the Glory of God from the Dizzy Dozen." 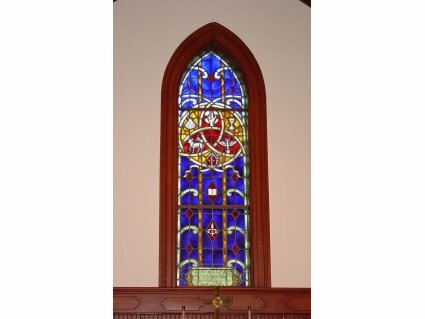 The windows were designed and created by Mrs. Vera R. Sattler, owner of the studios of "Fine Arts by V. R. Saltier". South Sacristy Window above the door is the only window from the original church. 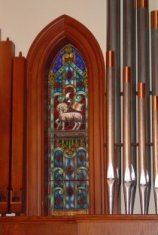 The Olford Memorial Windows above the organ pipes were in memory of Stephen Oldford (center), Mary Lucy Oldford (on left), and Betty Louise Oldford (on right). The James F. Norman window in the vestibule represent the church portion of his life. He was a licensed lay reader/chalice bearer, sang in the choir and really was a caretaker for years at Trinity. The "Herr" was his nichname, as he taught German at Port Huron Northern High School for many years before his retirement.